Part 10: Update – Bentwaters 1980, Telepathic Lights? 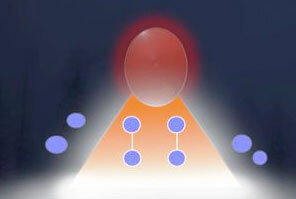 81st Security Police Squadron, Bentwaters AFB, U. K.
Computer illustration of sketch by John Burroughs of lights in Rendlesham Forest, 3 AM, December 26, 1980. Artwork by John Rackham. April 16, 2010 Albuquerque, New Mexico - On April 10, 2010, at the Eureka Springs, Arkansas, UFO conference, I presented a 2-hour update of my continued investigation of the December 1980 to January 1981, unidentified aerial lights and craft phenomena at the then-joint U. S. and U. K. RAF Bentwaters and Woodbridge air base northeast of London in Suffolk County, England. I have broken that 2-hour presentation down into several parts that begin today in Part 1.